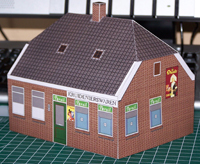 1/72 scale paper model of a Dutch village shop. This shop dates back to the end of the 19th Century. The owner lives in the same building, at the left. The shop windows are empty, and there's a "closed" sign on the door. Did retreating Germans relieve the shop of it's last rationed supplies, or is the shopkeeper just being careful?